Human peripheral lymphocytes stained with Multi-Colour Human CD3/CD16+CD56/CD45/CD19 flow kit (4C007). 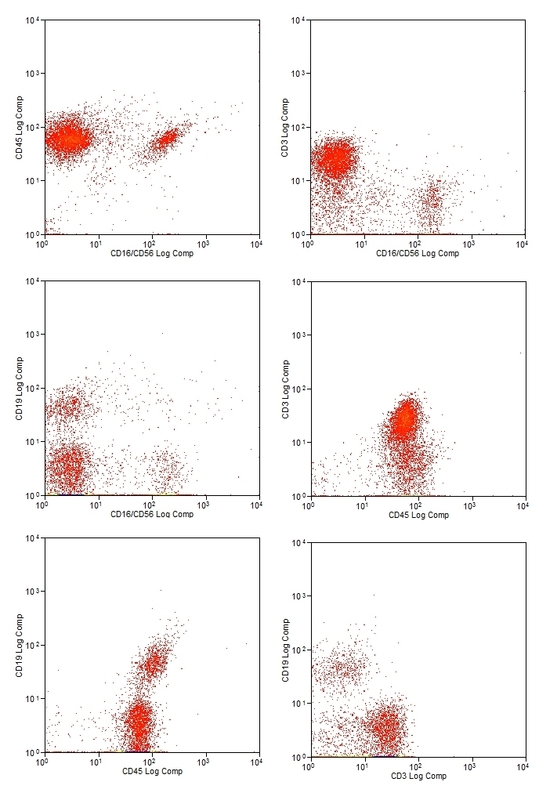 Four-Color Human CD3/CD16+CD56/CD45/CD19 Flow Kit can be used for single-step identification of T-cells (CD3+), B-cells (CD3-CD19+) and NK cells (CD3-CD16+ and/or CD56+), useful in the study of NK-mediated cytotoxicity against malignant and virally infected cells and the characterization and monitoring of immunodeficiency and autoimmune diseases. CD45 is a 180-240 kDa complex glycoprotein and member of the protein-tyrosine phosphatase family, otherwise known as leucocyte common antigen (LCA), and is expressed on all haematopoietic cells with the exception of mature erythrocytes and platelets. CD45 is a complex molecule existing in a number of isoforms including CD45RA and CD45RO. Clone F10-89-4 reacts with all isoforms. CD3 is a member of the immunoglobulin superfamily, which acts as a mediator of signal transduction, through association with the α/β or γ/δ T-cell receptor (TCR). Mammalian CD3 is a multimeric protein composed of four distinct polypeptide chains (ε, γ, δ, θ), consisting of two heterodimers (εγ, εδ) and one homodimer (θθ). CD3 is expressed by a high-percentage of circulating peripheral T-cells and is considered a pan T-cell marker. Clone UCHT1 specifically recognizes the ~20 kDa CD3ε chain. CD19 is a member of the immunoglobulin super family, which acts as a critical signal transduction molecule and regulator of B-cell development, differentiation and activation. CD19 is expressed on follicular dendritic cells and B-cells, from earliest recognizable B-lineage cells to B-cell blasts, but is lost on maturation to plasma cells. As such, CD19 is a commonly used pan B-cell marker. CD16/CD56, used in combination, facilitate the identification of natural killer (NK) cell sub-populations which express CD16+/CD56+, CD16+/CD56- or CD16-/CD56+ but lack CD3 and T-cell receptor (TCR) expression. There are important functional differences between these NK cell subsets. CD16-/CD56+(bright) cells, a minority in peripheral blood but representing the majority of NK cells in secondary lymphoid tissues, exhibit a high cytokine production capacity but are less effective at mediating antibody-dependent cellular cytotoxicity (ADCC) and natural NK cytotoxicity than other subsets. Four color combination consisting of PERCP, FITC, RPE and APC conjugated monoclonal antibodies mixed in optimal ratio - lyophilised.